Homogenizer generator probe maintenance is vital to ensuring accurate homogenizing and the integrity of your sample. How do I know my generator is in tip-top shape? A few reminders and tips to maximize your generator's performance. 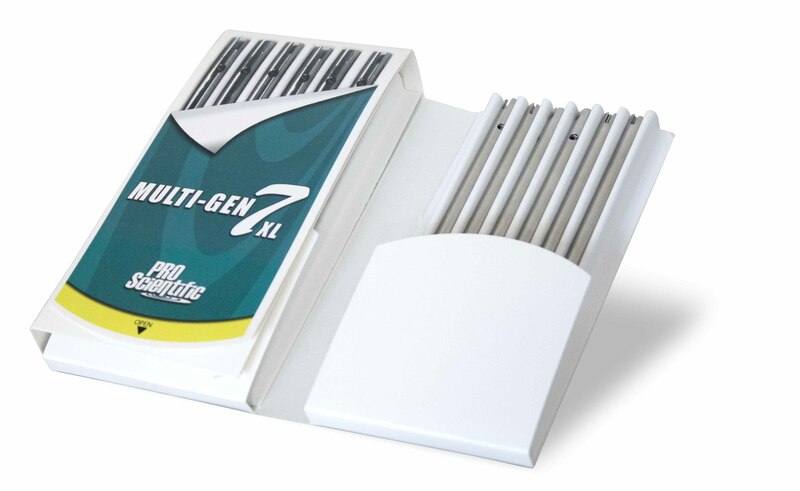 Tips to maximize your PRO Quick Connect Generator Probe and Multi-Gen 7 / 7XL's performance. Never run the generator assembly dry. The generator requires liquid sample/medium to lubricate the bearings during processing. If dry sample processing is needed, please contact a PRO Scientific representative to discuss using alternate materials for your lower bearing. Without the liquid, the PTFE bearings can burn out and cause damage to the generator itself. A quick increase in speed will actually push the sample away from the probe and inhibit homogenization. If you are processing a small volume in sample and running at max speed be careful that you aren't pumping the sample through the probe quicker than it can recover. If the samples is moving through the probe quicker than it can recover the probe will begin in essence to homogenize pockets of air and this dry homogenizing can damage the probe. 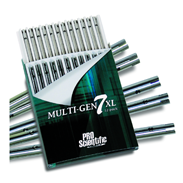 When using Multi-Gen 7XL probes, it is not recommended to run at more than half speed (16,000 RPM). If this is required, please contact a PRO Scientific representative to discuss modification of your equipment. Make sure you are processing the recommended sample volume for the generator/generator assembly you are using. Too small a sample volume and too fast of a homogenizing speed could damage your generator probe. If you are unsure if this is the correct generator for your application, please contact a sales representative before using the generator. Regular maintenance and inspection / replacement of wearing generator parts is recommended and will thereby extend the life of this valuable piece of equipment. Is the upper white Polytetrafluoroethylene (PTFE) washer missing? These tend to get misplaced when cleaning and often the generator is reassembled without the PTFE washer. Is the white PTFE washer worn? If you answered yes to either of these questions, then you will need to order replacement upper PTFE washers. Find the correct lower bearing part number for your generator. Visit our generator replacement parts page on our website. Speak with a sales consultant at PRO Scientific, P#203-267-4600, sales@proscientific.com, and they will be happy to assist you in finding the correct replacement part for your generator. Replacement of upper stainless steel bearing should be performed by PRO Scientific Service technician or authorized distributor. Contact PRO Scientific service department, at P#203-267-4600, sales@proscientific.com , and request a return authorization for generator. All generators that are 120mm in length and longer contain a mid-bearing, which is located inside the generator approximately half way up the shaft. The mid-bearing must be lubricated by the sample/liquid during processing, therefore the sample volume should cover about half the length of the generator. Replacement of mid-bearing should be performed by PRO Scientific Service technician or authorized distributor. The lower and upper PTFE bearing for all Multi-Gen Generator probes is the same. You will need to order part number PRO-03-11703P (6 pack of MULTI-GEN lower PTFE bearings). Dismantling and Assembly Instructions for PRO Quick Connect Generator Probe and Multi-Gen 7 / 7XL's performance. The following instructions are for the assembly of only 5mm generators. Insert the lower bearing into the bottom of the tube and collar assembly. Take the rotor knife and place it into the bottom of the tube and collar assembly and push the lower bearing into its proper location. The proper location is when the end of the rotor knife is flush with the bottom of the tube and collar assembly. Attach the rotor shaft collar to the end of the rotor shaft. Make sure that the setscrew in the rotor shaft collar lines up with the flat on the end of the rotor shaft. The rotor shaft collar should be located as close to the end of the rotor shaft as possible. Slide the PTFE washer up the rotor shaft until it contacts the rotor shaft collar. Insert the rotor shaft with the rotor shaft collar and PTFE washer attached into the upper end of the tube and collar assembly. The rotor shaft should rotate freely within the tube and collar assembly. If the rotor shaft does not rotate freely, remove the rotor shaft from the tube and collar assembly and inspect both the upper and lower bearings for any possible damage. Replace any damaged bearings. Insert the rotor knife into the end of the tube and collar assembly and rotate the knife clockwise while holding the rotor shaft collar. Once the rotor knife is threaded onto the end of the rotor shaft, insert the ¼” hex wrench into the end of the rotor shaft collar and the screwdriver into the end of the rotor knife and lightly tighten. With the rotor knife attached, place the generator with the blade end downward onto a flat surface. Loosen the setscrew located on the side of the rotor shaft collar. Push the rotor shaft collar downward until the nylon washer is in contact with both the bottom of the rotor shaft collar and the top of the upper bearing. Tighten the set screw and check that the generator rotates freely. The following instructions are for the dismantling of 5mm generators ONLY. Unscrew the rotor knife from the bottom of the rotor shaft. Insert the 1/4" hex key (supplied in the tool kit) into the end of the rotor shaft collar and insert the screwdriver (supplied in the tool kit) into the rotor knife and turn the hex wrench counter clockwise. Remove the rotor knife from the bottom of the generator tube and collar assembly. Draw the rotor shaft and rotor shaft collar assembly upwards out of the tube and collar assembly. The PTFE (polytetrafluoroethlyene) washer can be removed from the rotor shaft. Remove the lower bearing from the bottom of the tube and collar assembly. The lower bearing should be replaced when worn before the rotor knife starts to rub against the side of the stator. The rotor shaft collar assembly can be removed from the rotor shaft by loosening the set screw located at the side of the rotor shaft collar using the hex wrench end of the screw driver (supplied in the tool kit). The following instructions are for the assembly of only 7mm, 10mm, 20mm and 30mm generators. Slide the lower bearing onto the rotor shaft. Attach the rotor knife to the rotor shaft by screwing it together until tight (hand tighten). Insert the Rotor Shaft into the end of the tube and collar assembly. Then push the rotor knife up into the end of the tube and collar assembly until it cannot go any further. This will put the lower bearing into its proper place. The rotor shaft should stick out through the upper bearing located in the top of the tube and collar assembly. While pushing against the rotor knife, place the PTFE washer over the end of the rotor shaft and put the rotor collar assembly onto the rotor shaft. While holding the rotor knife, align the setscrew on the side of the rotor shaft collar and the flat end on the rotor shaft so they are facing each other. Once lined up with one another, tighten the setscrew against the flat end of the rotor shaft using the hex wrench end of the screwdriver tool (supplied in the tool kit). Insert the ¼” hex key (supplied in the tool kit) into the end of the rotor shaft collar and insert the screwdriver end into the rotor knife and turn the hex wrench clockwise to confirm its tight (Over tightening of the rotor knife onto the rotor shaft can result in breaking of the rotor shaft and/or distorting of the rotor knife). The following instructions are for the dismantling of only 7mm, 10mm, 20mm and 30mm generators. Unscrew the rotor knife from the bottom of the rotor shaft. Insert the ¼” hex key (supplied in the tool kit) into the end of the rotor shaft collar and insert the screwdriver end into the rotor knife and turn the hex wrench counter clockwise. Remove the rotor shaft collar assembly by loosening the setscrew located in the side of the rotor shaft collar from the rotor shaft using the hex wrench end of the screwdriver tool (For convenience, do not fully remove the setscrew from within the rotor shaft collar assembly). Remove the PTFE washer from the rotor shaft. Draw the rotor shaft downwards out of the tube and collar assembly. (If rotor shaft does not slide out, press down on the rotor shaft from the top of the generator tube and collar assembly using the hex wrench end of the screwdriver tool). Remove the lower bearing from the end of the tube and collar assembly using the screwdriver. The screwdriver should be inserted high enough to reach the inner side of the lower bearing. Put the flat side of the screwdriver against the lower bearing, and then pull the handle of the screwdriver against the saw-teeth or open-slotted end of the generator probe. The lower bearing should come out. The lower bearing should be replaced when it shows signs of wear and before the rotor shaft collar starts to come in contact with the inside wall of the motor collar or starts to rub on the top of the tube and collar assembly. The following instructions are for the assembly of Multi-Gen 7 & 7XL generators. Insert upper PTFE bearing (bearings are interchangeable) into the upper end of the generator tube-bearing, flange out. Place the lower PTFE bearing into the lower end of the generator tube- bearing flange out. Slide shaft into the lower end of the generator tube until knife is flush with tube, making sure threaded end of shaft comes through the upper PTFE bearing. With finger keeping knife flush with bottom of tube, hand tighten drive collar. FINAL ASSEMBLY STEP FOR MULTI-GEN 7 ONLY: Place the screwdriver into bottom of the generator and holding the drive collar turn the screwdriver clockwise. FINAL ASSEMBLY STEP FOR MULTI-GEN 7XL ONLY: Place allen wrench across and through the open slot of the XL generator to ensure tightness of assembly and holding drive collar turn screwdriver clockwise. The following instructions are for the dismantling of Multi-Gen 7 & 7XL generators. Continue with step 3 from 7XL instruction below. While firmly holding the drive collar at the upper end of the generator (opposite end of the screwdriver) turn the screwdriver counter clockwise. If the drive collar is not held securely it will spin with the screwdriver, thereby not allowing the knife assembly and rotor shaft to be unscrewed from the drive collar. With the drive collar removed, the rotor shaft knife assembly will slide out the bottom of the generator tube. The upper PTFE bearing can now be removed from the upper end of the generator tube. The lower PTFE bearing can now be removed from the lower end of the generator tube. Multi-Gen parts can now be placed on a tray and autoclaved as necessary. Cleaning of PRO Quick Connect Generator Probe and Multi-Gen 7 / 7XL's. Immediately after you have finished working with the generator, the generator must be cleaned so that the substance residues do not stick to the rotor and stator and allow small bacterial cultures to form in undesirable places. For this purpose, the generator should be run in a solvent, which dissolves the substance residue and does not harm the components. The rotor and stator are cleaned as the solvent is pumped through the generator. Please ensure that all cleaning processes are compatible with 316SS and PTFE. Chemical process - Germicidal solutions (formalin, phenol, alcohol etc.) can disinfect in most cases. Residues of the germicide must subsequently be removed with sterilized water. Please ensure that all chemical processes are compatible with 316SS and PTFE. Sterilizing by humid heat – This means sterilizing with steam at a pressure of 2 bar above atmosphere and a temperature of 120oC. PRO Generators are heat resistant up to 390° F / 198° C.
Sterilizing by hot air - Hot air sterilization is normally carried out at 160 to 190oC. Flaming - This method can be used, however, it is only effective on external surfaces.